The LG Series is an excellent, economical solution for tensile or compression testing. These mechanical force gauges fits naturally in the hand for a comfortable and firm grip, even at maximum loads. The Chatillon LG Series is a low cost force measurement solution, ideal for a wide range of force testing applications. 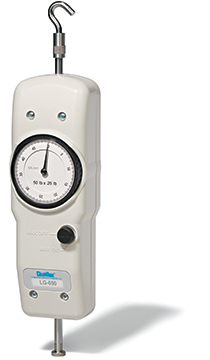 These mechanical force gauges features a 2.25-inch dial and an accuracy of +0.5% of full scale, along with a peak hold button for capture of the peak readings and easy return to zero. The concentric dial measures clockwise only, and rotates 360 degrees for taring. A mechanical overload feature protects the force gauge from damage. The mechanical force gauge fits naturally in the hand for a comfortable and firm grip, even at maximum loads. It can also be mounted to a test stand for even greater control and consistent results in repetitive testing applications. Apply a pulling force to disconnect cables and hoses, and record maximum necessary tension. Check switch operation for “go”/”no go” or mount on a test stand to check the necessary compression force to engage a breaker. Find out which adapter you need for your LG mechanical force gauge in this Connection Diagram. Find the Declaration of Conformity for the LG Series mechanical force gauge here.